Last Updated Apr 2019 – You can have amazingly expensive kitchen equipment, full of high tech gadgets, but without a good set of pots and pans, your kitchen is as good as a luxury car without an engine; you can flaunt it, but you cannot use it. The quality of your cooking is not only impacted by cooking style, skill, and ingredients, but it is also hugely affected by the quality of the pots and pans you use. Poor quality pots and pans can cause uneven cooking, burn food, or worse still, burn your hands. The best pots and pans are the ones which are safe, durable and work well. Once you buy this set of pots and pans, you will never again have to buy another piece of cookware. The hard anodised material in this set gives it extra ordinary strength and durability. This sturdy set is designed and constructed to serve your kitchen through generations. This one comes with a non stick finish and hard-anodized aluminium construction with an aluminium core. If you are just setting up your kitchen, this set has all your basic culinary needs covered. We firmly believe that behind every great chef there is great cookware. A good set of pots and pans call for considerable investment, and you need to make an informed choice to ensure that your cookware serves you through years and makes cooking a pleasant experience for you. To make the choice easy for you, we have compiled a roundup of five sets of the best pots and pans to buy online. Whether you are a professional chef or a homemaker struggling through experiments in the kitchen, this list will help you make the right choice. Stainless steel cookware is an all time favourite amongst chefs and home makers. It is durable, easy to maintain, and offers fast and safe cooking. This 12 piece set from Cuisinart includes 1-1/2- and 3-quart saucepans; 8- and 10-inch skillets; 3-1/2-quart saute pan; 8-quart stockpot; steamer insert. This means, once you buy this set of pots and pans from Cuisinart, you will never again have to buy another piece of cookware. This ergonomically designed cookware set has a stainless steel construction with an aluminium core, and the handle has a perfect design that allows an easy and controlled grip. The handles remain cool even on the stovetop, so you don’t ever have to worry about getting your burning your hands when you are belting out high heat. The lids fit perfectly, sealing in heat, moisture and flavor. It’s a great choice for both professional and domestic use. This 11 piece set of non-stick hard anodised cookware has all your cooking related needs covered. It includes 15 quart and 3qt covered saucepans, 8-quart covered stockpot, 8 inch and 10-inch open skillets, 3-quart covered saute pan and 12 inch shallow grill pan. From making grilled fish, to chicken stew and stir fried veggies, there is hardly a recipe that you cannot achieve with this comprehensive set. The hard anodised material gives it extra ordinary strength and durability. 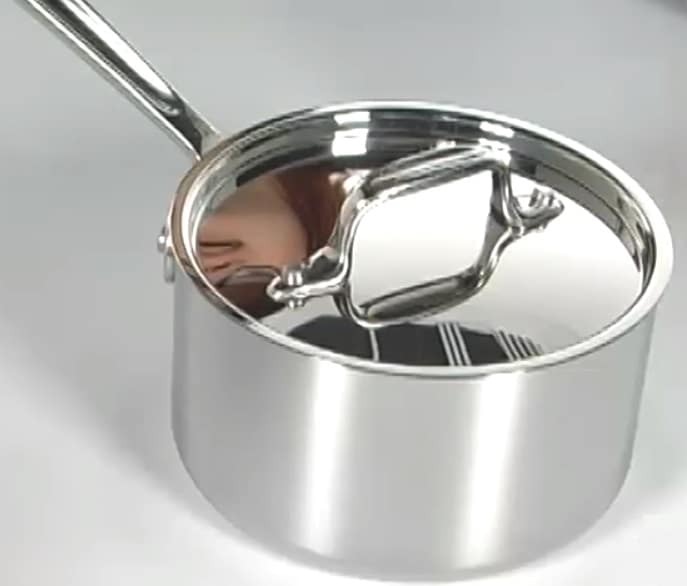 These pots and pans from Anolon have been designed to cook food evenly and reduce hot spots. It adds agility to your cooking allowing you to cook a super quick dinner after a hard day’s work. The beautiful bronze colour and tulip shape of the cookware will add a bit of class to your kitchen. It comes with a transparent, break resistant lid, which keeps the heat and moisture in, and allows you to monitor your food with ease. The silicon handles are comfortable and oven proof. This 17 piece cookware set will satisfy the culinary needs of even the most demanding of chefs. It includes 1-1/2-, 2-, 3-quart saucepans; 8-, 10-, 12-inch skillets; 4-quart saute; 9-quart stockpot; 7-3/4-, 9-1/2-inch steamer inserts; with lids. There is nothing more that you can ask for in a cookware set. Just like its smaller brother that we discussed above, it has a stainless steel construction and an aluminium core. This sturdy set is designed and constructed to serve your kitchen through generations. With this set of Cuisinart’s best pots and pans as your partner in the kitchen, you can expect cooking to be quick and hassle free. The mirror polished lids not only render an aesthetic touch, but they also fit perfectly to lock in moisture. If you think that steel handles can be a little harsh on your hands, you can lay your doubts to rest, as these nicely designed handles are made of riveted steel that does not heat up on the stovetop. This one again is a 17 piece comprehensive set of some of the best pots and pans you can get. It includes: 1-1/2-, 2-, 3-quart lidded saucepans; 8-, 10-inch skillet; 12-inch lidded skillet; 4-quart lidded saute; 9-quart lidded stockpot. To make cooking even better, it comes with a 7-3/4-inch lidded steamer insert; 9-1/2-inch pasta insert. So, how is it different from the 2 sets we just discussed? This one comes with a non stick finish and hard-anodized aluminium construction with an aluminium core. So, extra durability and an extra ordinary smooth finish is what you can expect from it. The classic black-gray colour can add a zing and elegance to any kitchen. The lids are break resistant, and the handle heat proof. This one might just win the contest for best pots and pans for a small kitchen. If you are not a big cooking enthusiast, or you are just setting up your kitchen, this set has all your basic culinary needs covered. This 10 piece stainless steel cookware set includes 1-1/2-quart and 3-quart covered saucepan, 8-inch and 10-inch open skillet, 8-quart covered stockpot, and covered steamer insert. Thankfully, the handles remain cool even on stovetop, and are designed in a way that allows a comfortable grip. Lids also secure tightly allowing for healthy and quick cooking. Speaking of the best pots and pans sets available out there, it is quite essential to have an insight into what exactly the cookware consists of. 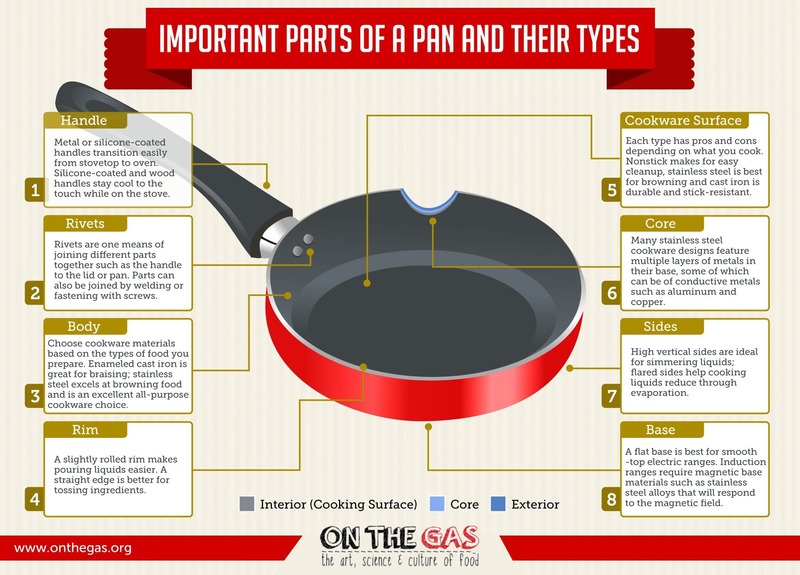 To help you select the set that fits your needs just perfect, this infographic showcases the most important parts of a pan and their types, the variety of surfaces as well as what are they meant for. – Handle:Wooden or silicone-coated handles stay cool throughout the cooking, while metal handles are suited for both the oven as well as stovetop. – Rivets:Rivets connect one or more parts together, mostly the handle to the pan or the lid. – Cookware Surface:Choose the pan surface according to the food you are cooking – browning is easy with stainless steel while cast iron is totally non-stick and easy-to-clean. – Rim:While curved rims are great for handling liquids, adding ingredients call for a flat edged pan. – Body:Stainless steel is the cookware material that blends in with just about any kind of food preparations, while braising goes best with enamelled cast iron. – Core:Most high quality pans have stainless steel forming the outer and inner layers, with aluminium, copper or other magnetic or conductive substances going for the middle layers. – Sides: Prefer going for flared sides while preparing food, while high vertical sides work wonders for heating liquids. – Base: If you have an induction cooktop, go for stainless steel or other magnetic bases. On the other hand, electric ranges work best with flat-based cookware. Now, that you are armed with a good amount of knowledge on the best pots and pans to buy, just go ahead and give your kitchen cookware a revamp. But in the words of Tim Shaw from Demtel – Wait! There is even more!! Buying cookware online offers several distinct advantages over getting it in the store. You’ve got a much bigger selection to choose from, it’s usually cheaper, and you get the cookware delivered to your door at little or no cost. This gives you the very best cookware for your kitchen while saving you time, money and hassle. Think about it like this: if you go to your favorite retail chain, how many cookware sets are there going to be for you to choose from? Can you choose your favorite Cuisinart Multiclad line, or are you going to have to settle for a lesser alternative? Even if they do have it, are you willing to pay a premium to actually buy it in the store? Online prices are usually lower these days. Finally, how much time do you really want to devote to finding a big box of pots and pans in a crowded outlet? 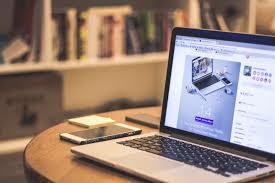 It’s much easier to look at reviews and do your shopping on your computer, tablet, or phone. You learned all about the parts of a pan above. But what about different types of pans? 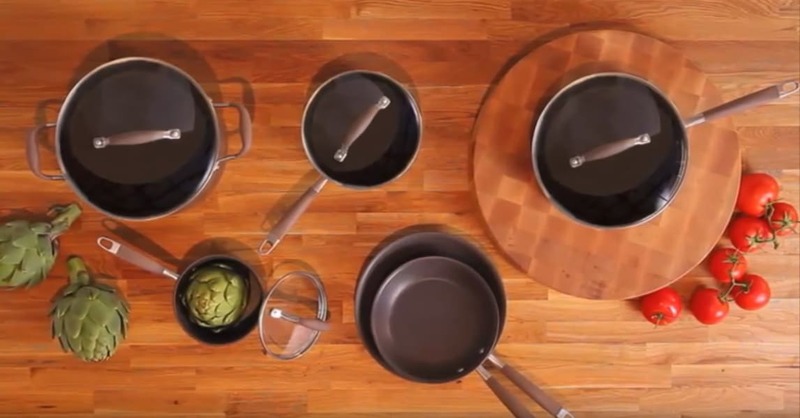 Which ones should you keep in your kitchen and what should you use each pan for? 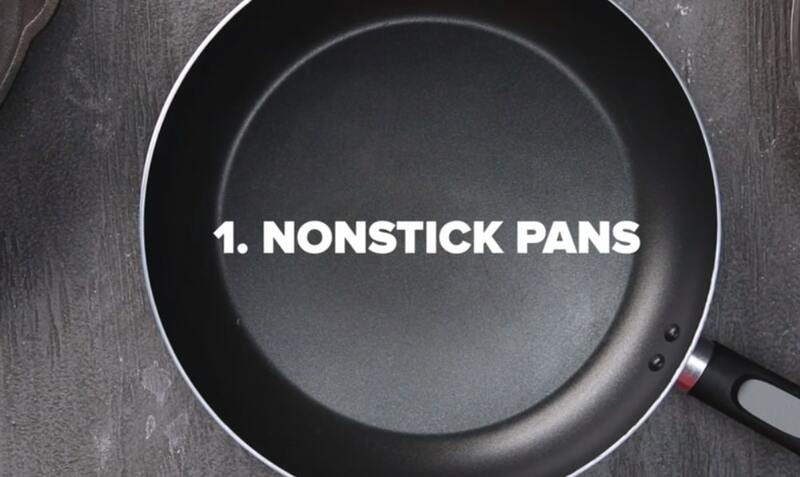 The first (very common) type of pan is the frying pan. These versatile kitchen workhorses have flat bottoms and slightly rounded sides. They’re used for tasks that don’t involve lots of liquid. You might simmer something in a bit of shallow water or make a pan sauce in your frying pan, but you usually won’t be boiling water or steaming vegetables. 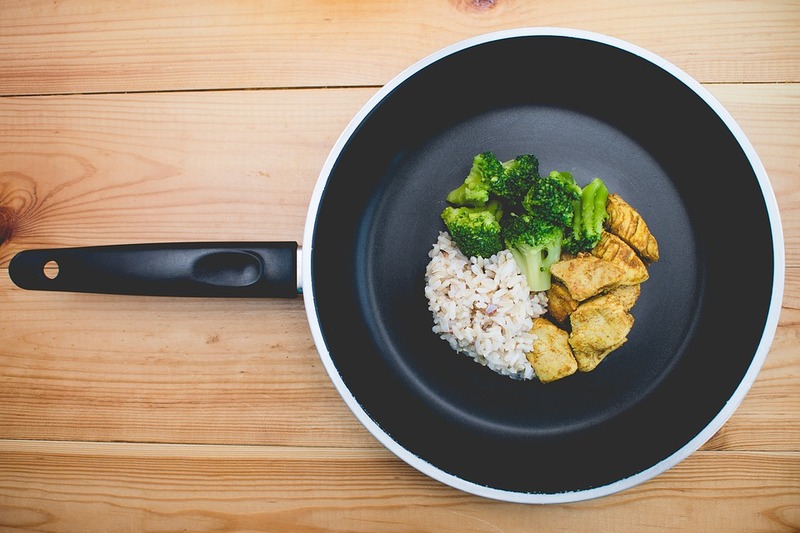 Frying pans are one of the most common types of cookware. You can saute in a frying pan or fry in a saute pan. So what’s the difference? Saute pans have straight sides and always come with a lid. This helps you keep food from flying out of the pan when you move it around and makes the pan a bit more versatile. 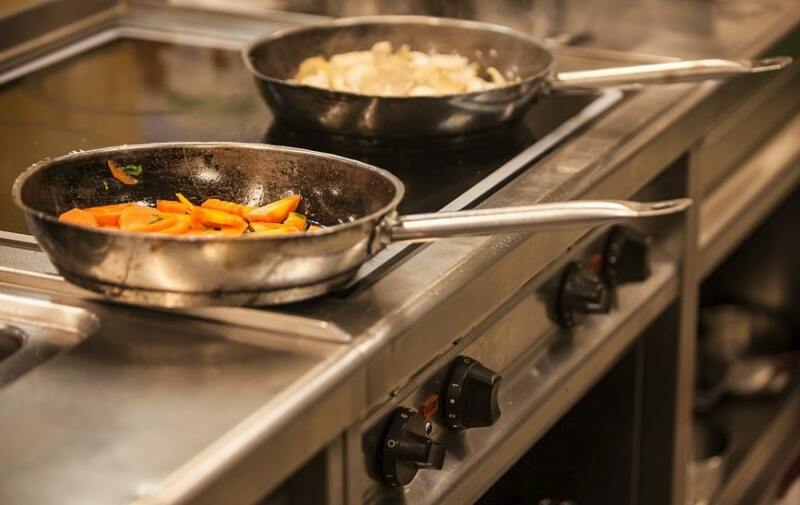 Saute pans can deal with liquids much more easily than frying pans, so they’re used for recipes that start off with dry cooking before transitioning into cooking liquids. You can still use saute pans for frying, browning, and searing, of course. Woks have a small flat portion in the center of very large sloped sides. They’re used for cooking multiple ingredients at different heat levels. Because the sides are farther away from the heat, food that’s placed on the wok’s edges gets less hot. On the other hand, food that’s placed in the center still gets hot very fast. Woks are a specialty item and are very useful for some types of Asian cooking. 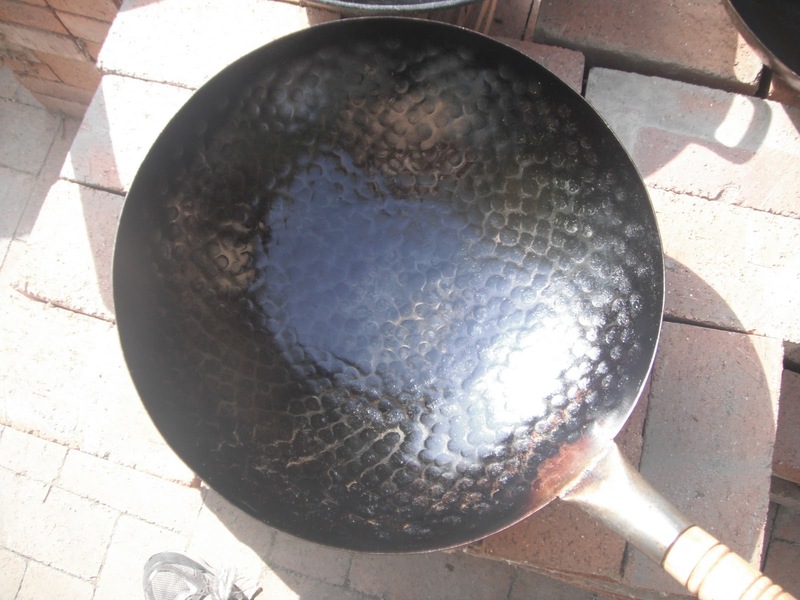 These frying pans have a specialty purpose due to the material used in their construction. Cast iron skillets are heavy, hold heat differently, and have to be treated differently than your normal frying pans. They’re very good at certain tasks, however, like high heat cooking, and some people find them better than non-stick pans for things like frying eggs. Both grill pans and griddles are large, flat pans with short sides. They’ve got a large amount of surface area, making griddles perfect for making pancakes, eggs, and other foods that are pretty flat and dry. Grill pans are similar but have ridges (sometimes removable) that put “grill marks” on meat that you cook. Stockpots are big and tall. They have long, straight sides, a lid, and can hold a lot of liquid. While you can brown things in a stockpot, they really shine when you have to cook with a large amount of liquid. You’ll often simmer things for a long time in a stockpot to make a flavorful broth (or a stock!). They’re handy for steaming food as well as making soups and stews. You can use them for deep frying as well if you’re adventurous. While they’re called “pans,” these pots have slightly rounded bottoms and tall sides that are straight. They have long handles and lids, which is a great combination for boiling water and simmering ingredients. The lids trap heat inside while the handles let you move the pot around safely without burning yourself. 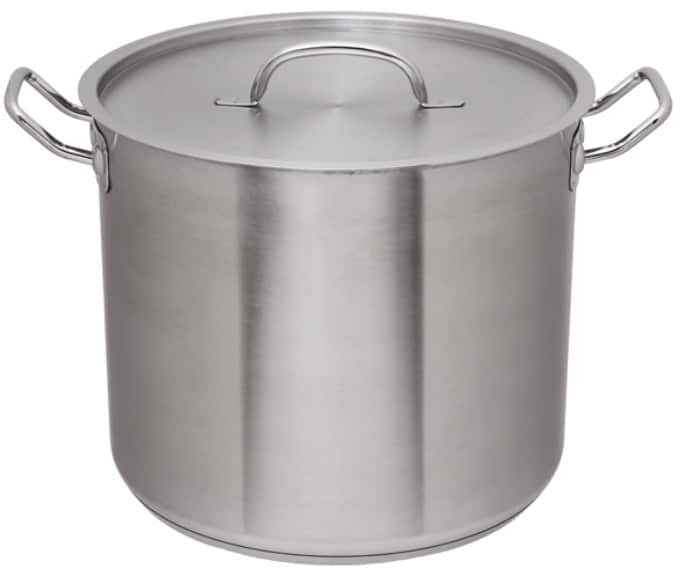 Saucepans are perfect for small soups and stews, although you’re better off using a larger stockpot for anything that calls for a large amount of liquid. They’re also great for boiling eggs, steaming veggies, and making reasonable servings of pasta. The lids on most pots don’t form a perfect seal. With a pressure cooker, however, you get a very tight lid that traps virtually all of the heat and steam. This can reduce cooking times and helps you get very tender meats and veggies in a small amount of time. 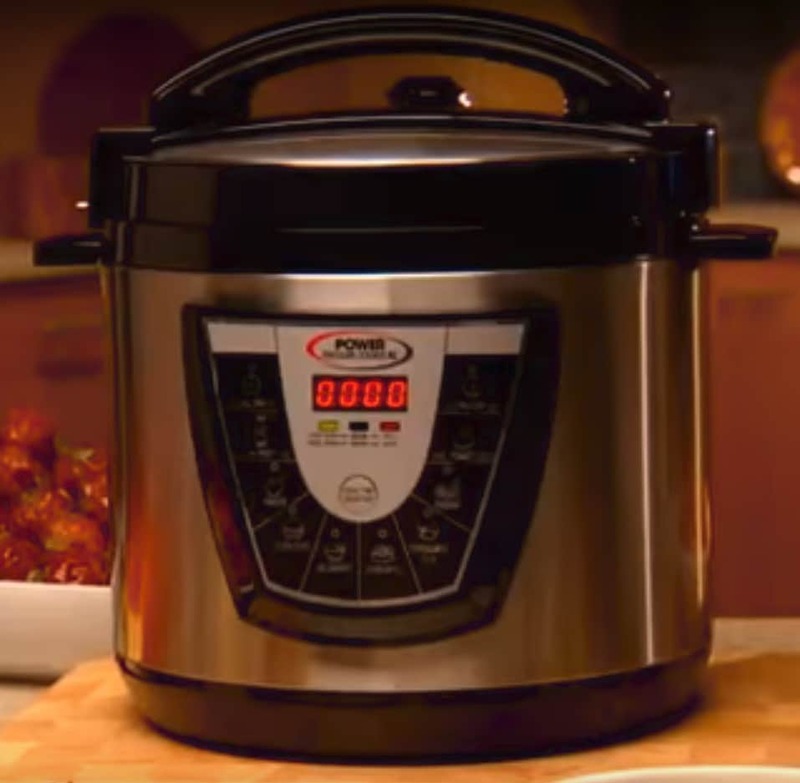 Modern pressure cookers often have sensors that can help regulate the internal pressure and give you the exact results you want. Pressure cookers usually look like smaller stockpots with straight sides, although you’d never confuse the two. This is because pressure cookers have an attached lid and often have a fancy hinge to keep everything sealed extra tight. There are a bunch of safety concerns with materials used in pots and pans. Some of these concerns are valid. Some are not. Generally speaking, nearly all consumer cookware is safe if it’s used correctly. We’ll briefly go over some of the more common safety concerns, however, and talk about how you can keep yourself safe by properly using your cookware or avoid them entirely. At some point in the past, Teflon was manufactured in a way that exposed it to hazardous chemicals. This has been phased out for many years now, but Teflon (which is a brand name for a type of chemical called PTFE) still carries a bad rap. Most experts believe that Teflon is INCREDIBLY food safe at room temperature. Several have even eaten flakes of it in response to internet challenges. Teflon works by being incredibly inert, which is to say that it’s very difficult to get it to change in response to another chemical. This means that it just passes through your digestive tract without being absorbed by your body. There is, however, a risk in using non-stick pans treated with PTFE. When PTFE is heated up to a very high temperature (300 F or more, with different formulations having different limits) it starts to release a toxic gas. This gas isn’t anywhere near as bad as it sounds. It usually only causes mild flu-like symptoms in people. It’s very good at killing birds, though. It’s hard to reach these temperatures while using your cookware normally. The most plausible scenario involves you accidentally leaving a pan on very high heat for a while. As long as you cook with medium heat (which is recommended anyway) and don’t leave pans unattended, PTFE is pretty safe. If you’d like to avoid these concerns altogether you can always use stainless steel pots and pans or choose a ceramic nonstick instead. When it comes to unsafe materials, aluminum is perhaps the worst offender. Aluminum isn’t safe to eat in large quantities and there’s been research that shows that quite a bit of it leaches from the pan you’re using to the food that you’re cooking. Some people think that this means you should avoid aluminum cookware. In practice, there’s no real reason to. Aluminum is almost never used as the cooking surface in modern pots and pans. Instead, there will be a layer of stainless steel or non-stick material in between your food and the aluminum. In any case, the FDA (and other experts) think that aluminum is a perfectly fine cooking surface. If you want to avoid it entirely, you’ll probably have to stick with cast iron, since most stainless and/or non-stick cookware has an aluminum core. 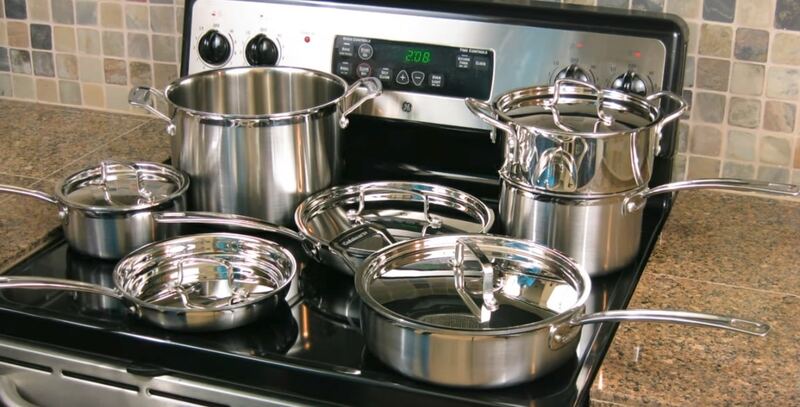 If you want to err on the side of caution, multi-ply stainless steel cookware is probably your best bet, because the aluminum is fully enclosed in stainless steel. Top cookware brands include All-Clad, Anolon, Cuisinart, Calphalon, Circulon, and T-Fal. All of these brands produce excellent cookware sets, although some brands tend to have better sets in certain styles. 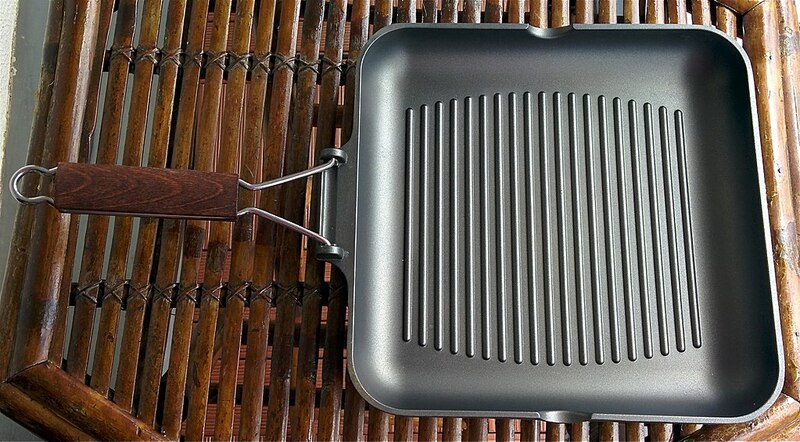 ALL-CLAD was one of the first companies to introduce multi-ply metal cookware. By wrapping aluminum in stainless steel, they were one of the first companies to bring light, durable cookware to the market. They’ve represented quality American craftsmanship since the 1970’s. Nowadays, they make cookware in a wide variety of styles. ANOLON and CIRCULON are owned by the same parent company. They originally specialized in non-stick hard-anodized cookware, with each company covering a different niche in the market. Since then they’ve both branched out and now make many types of pots and pans. CUISNART is a household name due to its other kitchen products. They’re a top cookware manufacturer, too, with many highly rated lines. CALPHALON pioneered the use of hard anodized aluminum cookware in the late 1960’s and early 1970’s. It’s since refined its cookware designs and branched out from its hard anodized roots. Like other top companies, you can find Calphalon pots and pans made from most popular cookware materials. T-FAL is the US imprint of French label Tefal. It started out making Teflon-coated aluminum cookware, although it’s expanded its horizons somewhat. Its inexpensive cookware sets are highly sought after on some online marketplaces. What Characteristics Make A Pofessional Pot or Pan ? Home and professional cooks share most of the same needs when it comes to cookware. 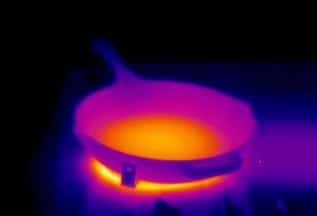 Two things in particular that some professional chefs look for in their cookware are durability and thermal conductivity. At home, you only use a pot or pan occasionally. In a professional kitchen, cookware often gets used for hours at a time, day after day. This means that professional chefs like cookware that’s a little bit more durable. On the other hand, they’re also a lot more willing to replace something should it break — they’ll usually have a spare. 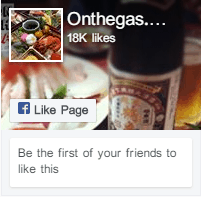 Cooks like it when food heats up fast. They also like it when their pan responds quickly to changes in burner temperature. This means that they’re especially mindful of how well their pots and pans conduct heat. Luckily, this isn’t much of an issue in modern cookware. Virtually every bit of cookware you can find comes with a core of aluminum, which is light, cheap, and very thermally conductive. This means that almost every cookware set off the shelf has very good thermal conductivity. If you want even more thermal conductivity, try a copper pot or pan. Copper pans are the best pans to cook with due to their incredible heat transfer, but that comes at a cost. They’re more expensive and they’re quite a bit heavier than pots or pans made from other materials. Different people cook in different ways. Now that you’re armed with knowledge, however, you can go out and find the perfect set for your kitchen. Based on the types of cooking you do, you can determine which styles of pots and pans you need. Our recommended sets cover a wide range of bases, from smaller non-stick sets to big stainless cookware sets that will last you a lifetime. By getting the cookware set that matches your needs, you’ll have the right equipment to have lots of fun making your favorite dishes each night. Best of all, with quality cookware, you won’t have to worry about your equipment limiting your culinary horizons! Mauviel Cookware Review – A Cordon bleu company! Jason lives in Osaka Japan and has an infatuation with raw fish, ninjas and sake. 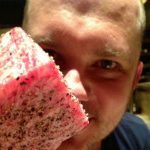 Originally from Australia he has a Masters in Communications and a Le Cordon Bleu Masters of Gastronomic Tourism. He also owns a very old Nintendo. I have been eyeing the Cuisinart Mcp-12n Multiclad Pro Cookware Set for a while now, as I wanted to get my kitchen properly set up – thanks for your helpful review! Great stuff! Yep the Multi Clad is a pretty good set … real pans .. none of this non-stick stuff ..